Be sure to bookmark the new site address and also sign up for our RSS feed or change your bookmarks/feeds to reflect the new address as nothing will be posted here from this point on! Look forward to seeing you at our new wahmmy home. Today's tip is one that many people see as a no-brainer, but honestly it's harder than many work at home moms realize once they actually start their business. With a new year almost a month underway, now is a great time to talk about goals and how to set them for an at home business or job. Patrysha from Easy Results with Radio brings us our WAH Tip this week. My best tips are to set and write down realistic achievable goals and then put yourself on a schedule to reach them. I know for me personally, setting goals is not an easy task. I have them in mind, but actually seeing them through is something I tend to put on the back burner. It's easy to do this in any business, but especially a service based business like the one I run. Clients needs and the money to be made from those tasks seem to take a front seat with me. This usually ends up meaning I put my own goals on hold thinking "I'll get to them as soon as I finish this for so and so." This is where setting goals that are reachable makes a difference. For instance, it's easy to set a goal of doubling our income this year. However, if you don't break it down and actually make a detailed plan to actually reach that goal, the likelihood of actually getting to the doubled income is very low. So, one of the things you can do is set that goal, but break it up into smaller more achievable goals. Here's an example. Main Goal - Reach Income of X amount of dollars. The point of making a list such as the one above is to give yourself something to look at and see that you are actually making progress. This is another biggie when it comes to reaching your goals. If you don't actually SEE the progress towards your ultimate goal, it's easy to get discouraged and give up. How have you set yourself up to see your goals through for your business or work at home job? We'd love to hear your ideas and be able to pass them along to others as well. Yes, this is a Mom blog, but you know you just have to give a little love to the men in our lives so today I'm posting some Man Rules just for our hubbies! Take note and hopefully you get a kick out of them as I did! Happy Saturday everyone! At last, a guy has taken the time to write this all down FINALLY, the guys' side of the story. We always hear " the rules" from the female side. Now here are the rules from the male side. These are our rules! Please note.. These are all numbered "1 " ON PURPOSE! 1. If something we said can be interpreted two ways and one of the ways makes you sad or angry, we meant the *other one*. 1. If we ask what is wrong and you say "nothing," we will act like nothing is wrong. We know you are lying, but it is just not worth the hassle. 1. When we have to go somewhere, absolutely anything you wear is fine... Really! Happy Friday Everyone! :) Can you believe it's Friday again already? For me this week has flown by and I feel like I'm not even close to having things done I needed to have done by today. Looks like a working weekend for me, but I hope that's not the case for you. As I was starting to plan my grocery list for the next week, I was browsing the net for deals and coupons and as always, my first stop was The Household Helper website. The owner, Cara Mirabella, has great tips for coupons and tons of other household things from saving time and money to helpful tips and hints to make running a household so much easier. She's got a blog where she posts coupons and deals on all kinds of things. You really should check out the CVS coupons she posts if you have a CVS nearby. I wish I had one close by because this girl knows how to walk out of there with tons of stuff and only spends a few dollars. I'm telling you she's the Queen of Couponing (yep, she made that word up I think). Anyway, today's freebie came in very handy for me and I think it will you too. Especially if you're looking for ways to save money especially on your groceries. I don't know about you, but I can easily spend $150 a week on groceries for my family of four and with a baby on the way, I know that's only going to go up and up. After all, I've got 2 growing boys and a hard working hubby who love their food! This is an awesome ebook that makes it super easy to put some of that hard earned cash back in your pocket and still have great meals the whole week through. I'm saying goodbye to that $150 chunk of change that comes out of my pocket starting this week thanks to this one. To get your free ebooks just sign up for the Household Helper newsletter. You'll see the sign up box in the top right corner of the page. Enter your name and email address and you'll be sent the link to download the ebooks. Be sure to come back here and let me know what you thought of them and how they helped your household run smoother. Enjoy and have a great weekend! Born and raised a Hoosier I just had to do it. ;) If you are a fellow Hoosier, you'll understand. Heck, if you live in the country or other places many refer to as "backwoods" you'll get it too! 3. Let's get this straight; it's called a "dirt road." I drive a pickup truck because I want to. No matter how slow you drive, you're going to get dust on your Lexus. Drive it or get out of the way. 4. They are cattle. They're live steaks. That's why they smell funny to you. But they smell like money to us. Get over it. Don't like it? Rt. I-70 goes east and west, I-65 goes north and south. Pick one. 5. So you have a $60,000 car. We're impressed. We have $150,000 corn pickers and hay balers that are driven only 3 weeks a year. 6. So every person in southern Indiana waves. It's called being friendly. Try to understand the concept. 8. Yeah, we eat tater & gravy, beans & cornbread. You really want sushi & caviar? It's available at the corner bait shop. 11. No, there's no "vegetarian special" on the menu. Order steak. Or you can order the Chef's Salad & pick off 2 pounds of ham & turkey. 12. When we fill out a table, there are three main dishes: meats, vegetables, and breads. We use three spices: salt, pepper, & ketchup. Oh, yeah.... We don't care what you folks in Cincinnati call that stuff you eat... IT AIN'T REAL CHILI !! 13. You bring "coke" into my house, it better be brown, wet & served over ice. 14. You bring "Mary Jane" into my house, she better be cute, know how to shoot, drive a truck, & have long hair. 15. College and High School Football is as important here as the Lakers and the Knicks, and a dang site more fun to watch. 17. Colleges? We have them all over. We have State Universities, Community Colleges, and Vo-techs. They come outta there with an education plus a love for God and country, and they still wave at everybody when they come for the holidays. 18. We have a whole ton of folks in the Army, Navy, Air Force, and Marines. So don't mess with us. If you do, you will get whipped by the best. 19. Turn down that blasted car stereo! That thumpity-thump crap ain't music, anyway. We don't want to hear it anymore than we want to see your boxers. Refer back to #1. 20. 4 inches isn't a blizzard - it's a flurry. Drive like you got some sense in it, and DON'T take all our bread, milk, and bleach from the grocery stores. This ain't Alaska , worst case you may have to live a whole day without croissants. The pickups with snow blades will have you out the next day. Today is the first day of Tell Me Thursday here at They Call Me Wahmmy. Tell Me Thursday was started by two moms who love all the pictures that appear on blogs for Wordless Wednesday, but really want to know the stories behind them. To participate and learn how it all works head over to TellMeThursday.com and check it out. So, for our first Tell Me Thursday here's the story behind yesterday's picture. If you missed it, you can see it here. It's my two year old playing with his army men earlier this week. On Monday I had a horrible toothache that basically left me on the couch with tylenol and an ice pack most of the day. Hunter did so good playing quietly that day. He and I watched a few movies and cuddled on the couch a lot of the day. 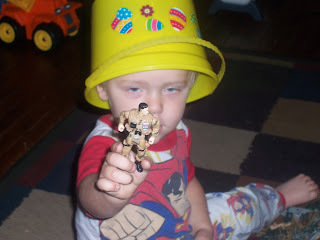 He has a bucket full of army men and he decided to dump them in the middle of the floor and play. At first, I thought "Oh no, not the bucket of army men for me to have to clean up." 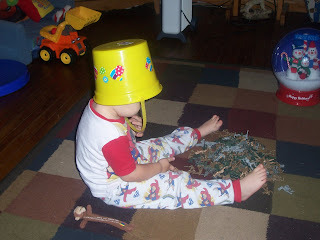 That thought completely disappeared when he put the bucket on his head. It was just too cute and I had to get up and snap a few pictures with my camera. He happily obliged and even wanted to be sure I got one of his fellow soldiers in the picture. Even with a horrendous toothache my little man made me smile. :-) Kids are a miracle I tell you, because just those few seconds of relief from my toothache were so welcomed and the hugs that followed were priceless no matter how much pain I was in. Sorry for the delay of yesterday's recipe post, but I was at the dentist getting a tooth pulled. More about that later though, for now here is Tuesday's recipe. If all goes well I'll have Wordless Wednesday up later this afternoon as well. :) Enjoy! Preheat oven to 350 degrees. Spray a glass-baking dish with a non-stick cooking spray. Put oil in a large skillet over medium heat. When oil become hot place pork chops in oil and cook until browned about 8 minutes. Turn chops and brown the other side for 6 minutes or so. Be sure chops are browned through. Remove chops from skillet and drain on paper towel. Reserve the drippings. In a large bowl break the bread up in to cube size pieces. The bread will probably come over the top of the bowl but it will settle once the liquid is poured in the bowl. Add chopped onions and margarine on top of the bread. Pour the reserved drippings over the bread and let soak into the bread. This will also start the margarine to melt. Allow all the liquid, including the margarine to soak into the bread. Once the liquid is absorbed and you can work with the bread better stir until the onions are incorporated into the bread mixture. Dissolve the bouillon cubes in the boiling water. Pour bouillon liquid into the bread. Stir immediately making sure all the bread is moist. Add salt and pepper to taste. Place a layer of the dressing into the bottom of the baking dish. Add 2 pork chops on top of the dressing. Layer more dressing and the last 2 pork chops. Top off with the rest of dressing. Bake 50 to 60 minutes or until dressing becomes crusty on top and is cooked through and no longer soupy. Today, I visited the church that my mother and father in law attend, and my husband grew up in, to listen to a guy preach that I went to my first year of college with and attended speech class with. Today after the service, I went up to him to introduce myself, and ask if he remembered me. Oddly enough, my husband and I recalled afterwards that it had been almost 10 years since I had class with him. However, nevertheless the time it had been he indeed remembered me. He seemed glad to see me and even recalled, "oh I have some funny memories with you. Do you remember the time I was doing the speech on welding and said, "Amen"? The funny thing is I had already recalled that to my husband. He was quite a hoot back then to hear giving a speech because he'd always be in "preacher" mode. I guess you can say he was destined to be a preacher. However, today, I thought to myself, "he's come a long way". He truly has become a preacher. He is a man called by God to deliver the word of God to His people. I began to think about the thought of "coming a long way" on the way home. You know if you're saved, and have a relationship with Christ, then you too have "come a long way" from wherever you were before. You have become a new person in Christ and you have a new identity, a new calling, a new purpose. We could all admit that we have "come a long way". I know I have, what about you, would you admit that today?? A few weeks back I talked about starting a prayer journal. Well this week's freebie is on the same topic. Journaling can be a very rewarding experience. Even if you don't have a journal specific to prayers or God, it's still a great way to look back on things that have happened in your life and see just how far you have come. Journaling is also a great motivator. For me personally, I journal for those reasons, but I also do it for my kids. I want them to see just how much they mean to me, get a look at what life is like for me. Don't you think when they have kids of their own they would love to see that they aren't the only ones who goes through the trying times with their kids? Who knows, maybe I can help them through a difficult situation in the lives with my journaling. I also find that my journal helps to remind me that things aren't as bad as they may seem. When I sit down at the end of the day to write, I find that many times as I'm rethinking my day and the stressful situations that occurred that day, I realize just how lucky I am to be sitting there with the ability to write the day's happenings down. I also take time to reflect on the positive things that happened that I may have forgotten about. We all know that bad things tend to outweigh the good, but when you are given the opportunity to replay the day, those good things pop back up and leave you with a smile on your face that had you not stopped and rehashed the day, you might have easily forgotten. If you've thought about starting a journal, but need some guidance getting started, check out our very own Spiritual Wahmmy, Alyssa's, Free 7 Day Journaling eCourse. Although it's catered to prayers, it can be a great tool for any type of journal. If you like what you see in the course and want to take your journaling a bit further, stop by and check out the 30 Day Journaling Guide as well.